Handling and management of tailings from a process plant is always a tricky and sometimes neglected part of engineering and operation. 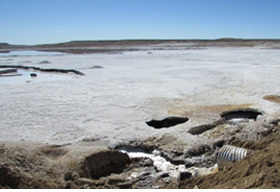 The tailings in mineral and ore processing plants contain some quantity of useful minerals which can be recovered for use and in case of disposal of tailings containing waste products, prevention of spread of the harmful substances to environment are issues of great concern that need to be addressed through application of appropriate engineering principles. Since the major focus in a production plant is on the main product output, the importance of management of the tailings tends to take a backseat during planning, execution and operation of the plant. However, in recent times, the rise in environmental concerns during both mineral/ ore extraction and tailings disposal and the scarcity of resources have forced the project owners to focus on this aspect of tailings management. 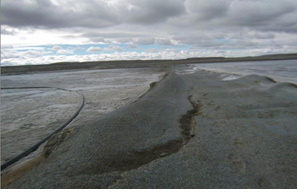 Proper management of tailings provides the plant owner with additional source of material recovered from the tailing ponds and enforcing control and mitigation measures for preventing the hazardous material from polluting the ground and ground water lends sustainability to the operation. TCE has designed solutions for handling of tailings of various process and ore beneficiation plants and designing the ponds and embankments for impoundment of the tailings slurry. The designs have added value to customer’s requirements in not only meeting environmental regulations but at the same time economized tailing pond operation, maximized available tailing area and facilitated recovery of useful material. The types of tailing handled vary from thin slurry form to thick slurry and high concentrated slurry with solids content of more than 70%. The proposed solutions cover both aspects of meeting the environmental norms for disposal and design suitable process for recovery of the useful mineral carried away with the tailings. In a recently executed assignment, the task was to study the health of the impounding dykes of tailing disposal pond system of mineral extraction and recovery plant. The facility comprised series of ponds separated by earthen dykes. The water in the tailing slurry is allowed to evaporate leaving valuable mineral deposit which is recovered from the ponds by dredging. The dyke between two ponds had started showing signs of distress with considerable seepage across the embankment and this was hampering mineral extraction from the lower pond. TCE carried out to study to assess the causes of this distress and profuse seepage from upper pond, investigate the strength of the present construction of the dyke section, and assess the stability factors of the existing dyke section. TCE also proposed remedial measures for strengthening of the dyke to improve the stability factors which will allow the plant owner to extract mineral from the affected pond for further period 3-4 years to recover the maximum possible amount of this valuable mineral. The dyke was homogeneous in nature, made up mainly of locally available silty clay type materials, without any impermeable core. The upstream and downstream slopes of the dyke were at 2.5(H) to 1(V). The dyke was not provided with any core, vertical chimney drain, horizontal drainage blanket or rock toe drain at the downstream toe. Health assessment of existing dyke was carried out through on-site visual inspection. Micro-scale cracks, large cracks of few feet length, rain cuts and slope failures were observed along the dyke crest in many areas, especially along the northern part of the dyke. Sink holes and flow channels were observed over the dry mineral deposit surface of the pond including large sinkholes along a hume pipe opening provided for the purpose of transferring excess water from upstream pond. Vehicle movement on the dyke was not possible; also it was difficult to walk on it due to wet and muddy surface along most of the dyke length, with relatively dry and loose nature of surface in other parts. Major risks to operating the tailing pond system were seepage/leakage through body of dyke and stability of dyke under different conditions of excavation. The engineering appraisal was aimed at evaluating the risk involved in maximising recovery of mineral having high commercial value. Stability of the partition dyke under various operational circumstances had to be established to meet acceptable level of safety so that the excavation can be carried out. The presence of crack lines / gaps on crest and a number of sink holes developed in deposited mineral deposit pointed to uncertainty on safety of the dyke. It was apprehended that part of the divider dyke could be on the verge of collapse during and/ or after excavation. This aspect had to be investigated for different stages starting from ‘as-is’ to completion of excavation. Stability of the dyke was assessed under different operating conditions of variation in water level, using geotechnical design parameters by established classical methods of slope stability analysis using professional/commercial software package. Analysis showed that dyke in existing condition would have adequate stability over its full length if the present conditions of upstream and downstream ponds remained unaltered. However, the plant operation program was aimed at maximizing recovery of mineral deposit from downstream pond and assessment of the condition of the dyke during and after completion of this operation was of paramount importance. Based on the health of existing dyke it was concluded strengthening by compaction would not be possible. The effort to compact the dyke along with two-stage raised sections from surface would not be effective because transmission of compaction forces 20-25 ft below would be almost impossible. High energy impact or vibratory compaction would also cause moderate to severe damage to the dyke. Effective closing of voids with any kind of injection grouting or slurry wall was ruled out. The high volume of water flow would not be controlled either by slurry cut-off wall or by grouting to close / seal water paths in a media full of voids. Water flowing through dyke after excavation in downstream pond would destabilize the dyke. Therefore only alternative left is to lower water level in upstream pond so that quantity of seepage / leakage could be brought under control. Attempt for evacuation of mineral without any protective measure could cause failure and collapse with major consequences. Therefore, methodology of excavation was developed after thorough study of different situation that could arise during progress of excavation or long thereafter. Stability in case excavation of mineral was carried out up to face of pond. Stability with a slice of mineral deposit left along dyke face to contribute to stability and arrest seepage as intrinsic permeability of mineral is very low. Reduction in stability in case water level in upstream pond increased during or after excavation was completed. Slope stability analyses were carried out using the computer program ‘Slope/W and Seep/W’ 2007 version developed by Geo-Slope. The Slope/w programs calculate the factor of safety against slope failure by two-dimensional limiting equilibrium method. Calculation of factor of safety against slope instability is performed using the Simplified Bishop method of slices, the Simplified Janbu method of slices, and Spencer’s method of slices. Stability of the dyke for above conditions was studied for both homogeneous and weak bottom dyke. The proposed solution would be successful in recovering more than 99% of mineral deposit reserve while ensuring the safety of the dyke by control of seepage flow through reduction of water level in upstream pond, adding weight of 10 feet of earth cover on the downstream slope and protecting the toe with rock mass and toe drain. The resultant factor of safety was more than the acceptable limit of 1.3 as required for short term static performance while the mineral would be excavated.